It does not matter what's the color of your skin, what language do you speak, what religion you believe in. It is that we should all consider each other as human beings and we should respect each other and we should all fight for our rights, for the rights of children, for the rights of women and for the rights of every human being. My mother always told me, hide your face- people are looking at you. I would reply, It does not matter; I am also looking at them. We liked to be known as the clever girls. When we decorated our hands with henna for holidays and weddings, we drew calculus and chemical formulae instead of flowers and butterflies. I don't know where to begin my speech. I don't know what people would be expecting me to say, but first of all thank you to God for whom we are equal and thank you to every person who has prayed for my fast recovery and new life. I'm feeling honored that I am being chosen as a Nobel laureate and I have been honored with this – this precious award, the Nobel Peace Prize. And I'm proud that I'm the first Pakistani and the first young woman or the first young person who is getting this award. It's a great honor for me. And I'm also really happy that I'm sharing this award with a person – with a person from India whose name is Kailash Satyarthi and his great work for child's right, his great work against – against child slavery. 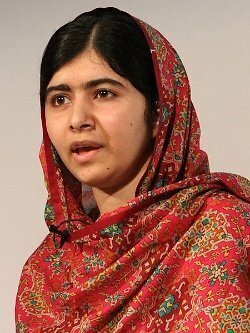 Bio: Malala Yousafzai is a Pakistani activist for female education and the youngest-ever Nobel Prize laureate.